8 of us spent a week doing the www.WinterGlacierSchool.org . It was very fun. Everyone met at the leader's house and some people slept on couches and floors, while others got a local motel room. After a delicious team breakfast, we spent a day checking our individaul and group gear and went to local mountain shops to rent or buy what we needed. There are so many mountain shops here, so there were a lot of choices. We went up to the mountain and set up our tents in the snow, rigged our harnesses, practiced roped glacier travel techniques, avalanche beacon location, snowshoeing and skiing. After the class we came down the mountain and had a nice dinner together, a beautiful ocean boatride, and a big bonfire on the beach. It was fun to meet everyone, to hang out, to climb together, and make new friends. We practiced crevasse rescue technique with prussics and ascenders in the rock gym. It was good to learn how to handle the ropes and tie all of the necessary knots. Afterward we checked out local wildlife such as seals, seagulls, and jellyfish, and then had a big celebration bonfire. Hanging stove in the doorway of a tent with ropes and Louisa in winter glacier camp. Heron on logs on a foggy day in Olympia. Murphy Osborne Photo. 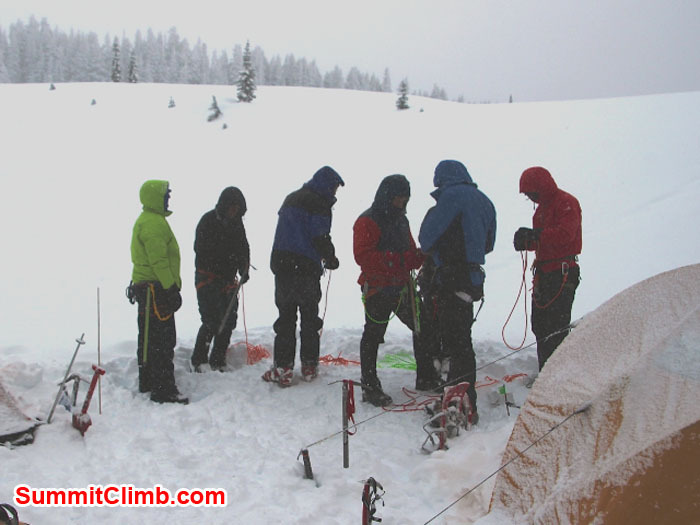 Crevasse rescue practice using prussics in the gym, during the Winter Glacier School. During the night a huge storm blew in and we decided to leave the mountain in high winds. A ranger met us in the car park and escorted us down the road to the main gate, which was locked. Apparently, we were the only people in the park. Jason belays Sujata and Estelle belays Marshall during ropes training. Jason Craddock and Dan Mazur climbing up during the Winter Glacier School. Murphy Osborne Photo. Louisa Lakos in a quiet moment in the tent. Murphy Osborne Photo. Jason high speed snowshoeing. Murphy Osborne Photo. Louisa and Dan talking to Ranger Rick. Murphy Osborne Photo.Louisa Lakos and Austin Leischer enjoying winter. Murphy Osborne Photo. Louisa packing in the parking lot. Look at the snowbanks. Louisa, Austin, and Dan heading up hill. Murphy Osborne Photo. Louisa practices crevasse rescue technique using a petzl ascender in the gym. Marshall and Jason practicing roped glacier travel in a blizzard. Murphy Osborne Photo. Marshall Trautman takes a break. Murphy Osborne Photo. Marshall Trautman wearing a headtorch and carrying a backpack during Winter glacier school. Murphy Osborne Photo. Team preparing their harnesses. 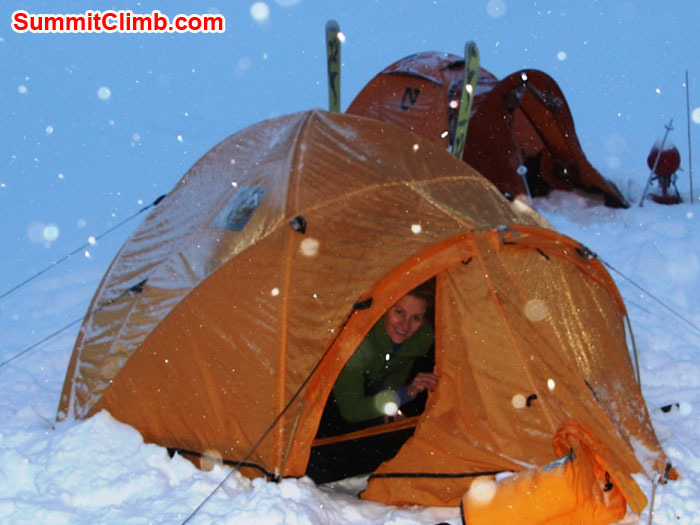 Valerie enjoys a snowstorm from inside her warm tent. Valerie snowshoeing around our camp. We awoke early and cooked breakfast in our tents, then set up our harnesses. After lunch we practiced locating avalanche beacons, then learned roped travel techniques. This afternoon a blizzard ensued and we received a lot of snow. Murphy Osborne snowshoeing around camp during the Winter Glacier School. Louisa Lakos Photo. Sea gulls and seal on logs in Olympia. Murphy Osborne Photo. Seal on logs in Olympia. Murphy Osborne Photo. Team packing up. Murphy Osborne Photo. Erik Morfin enjoys snowshoeing. Murphy Osborne Photo. Valerie practices belaying during a snowstorm. Valerie Carpenter watches the snowstorm during the Winter Glacier School. Murphy Osborne Photo. Murphy Osborne climbing during the winter Glacier School. Louisa Lakos Photo. Today our team ventured up to the mountain and set up camp on a ridge high above the glacier. Conditions were excellent, with good dry weather and consolidated snowpack. Celebration campfire after the Winter Glacier School. Photo by Murphy Osborne. Cormorants on log on a foggy day in Olympia. Murphy Osborne Photo. Checking personal gear. Preparing the 4 season tents. Looking at the big Everest boots at Feathered Friends. 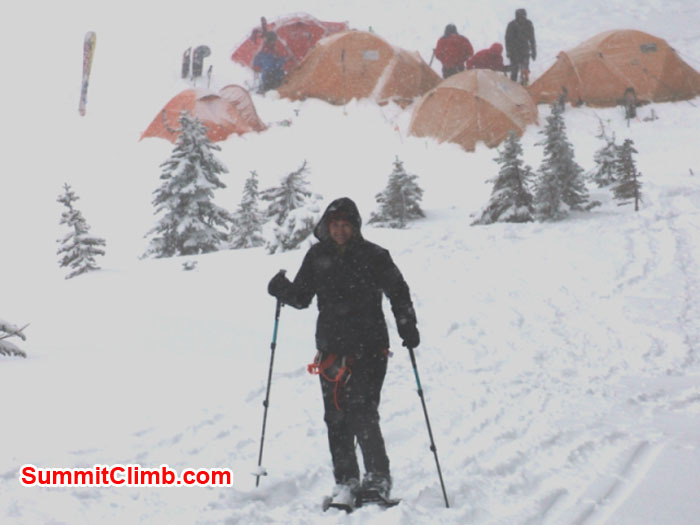 Renting and hiring boots and crampons at 2nd Ascent. Trying the big Everest suit at Feathered Friends. Studying the Mount Rainier map at REI. Team enjoys a delicious breakfast at a local cafe. Overhead view of the plastic model of the mountain. plastic model of the mountain. Tomorrow our www.WinterGlacierSchool.org begins. Everyone is very excited. Yesterday we went up to the mountain to check out conditions. They are excellent. Lots of snow!! Tomorrow all of the members arrive. Happy New Year and Welcome to the Team!! !